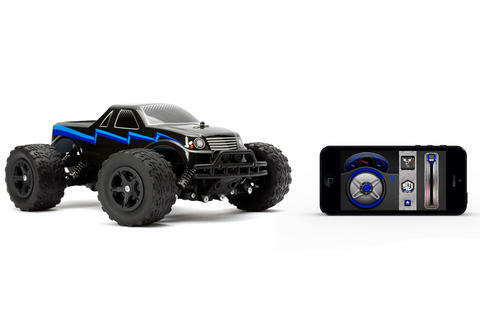 Bucking the common wisdom that using your cell phone while driving is stupid and irresponsible, the shoebox-sized MOTO TC Monster truck is actually controlled with one, which ironically only makes it a danger to passersby when you take your eyes off the screen. Driving for up to 18 continuous minutes on one charge, the MOTO's controlled via a dedicated app that enables you to steer in three different ways: 1) by sliding your finger across the display in a particular path, 2) using a virtual steering wheel & throttle on the screen, and 3) using your phone's gyroscope. What's more, you can even send it zooming in pre-programmed paths (figure eights, speedways...), or record one of your own.